Highly flexible and visual editorial tools for the new editorsand a highly scalable platform for delivering content as a service. Integrated with traffic measurement and audience segmentation systems, it helps the editor with decision-making andaudience oriented publications. Multiple support delivery from a centralized multimedia repository. Full Delivery Stack based on non-structure database and big-data technology. Optimized and PersonalizedMobile Experiences for reading and watching content. Attractive and easily-readable interface, navigable with just one finger. It increases staying time, page views and advertising impacts. 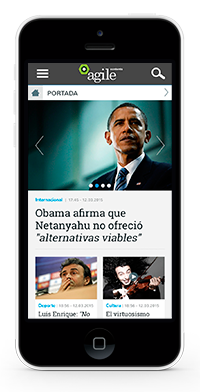 Learn more about our solutionsMobile PortalandSmart News. Agile Content helps Publishers and Brands toknow people as individuals, for serving them better, with more relevance, building greater value as a key to survival and success. Agile provides the tools to drive registrations, manage customer data, and improve cross-channel user relationships. Scalable and secure identity database. User Registration, Social Login, Progressive profiling, Cross-site login. Complete suite of user participation features: discussions, voting, content sharing, user-generated-content and more. Last generationVideo Management and Distribution Platform, that unifies the management of video, audiences and monetization. High performance player, multi-device for on-demand and live consumption. Player Addons that allow a differentiated experience when consuming video that generates more viewing time and more advertising impacts. Monetization oriented audiovisual content, with multi-format advertising support pre-integrated with Adservers and Adnetworks. Fast set-up of a complete pre-made multimedia microsite. Flexible, adjustable and easy to integrate. Full API for own developments. In today's highly competitive online advertising landscape, “standard” inventory is quickly diminishing in value, both for the advertiser and for the media itself. With an expensive and costly direct sales process, and remnant inventory dumping in exchanges; it becomes difficult to get the most out of selling advertising. In Partnership with Enreach, Agile offersAgile Enreach Direct Solutionto help publishers generate premium revenues from audience data by transforming each advertising campaign into a consumer research. Agile helps to transform traditional content into segmented and personalized multimedia experiences and value-added services. Agile Content helps Publishers and Brands to leverage New Revenue Streams creating a virtuous circle connecting Content, Technology and Share of Wallet. B2B2C models with White Label possibility. Easy integration with billing providers following different fee models. Content Licensing and Brand Deals can be provided by Agile. Flexible partnership models. It manages content distribution through several channels. Preconfigured package includes preconfigured connection to CDN Edge Suite to deliver content. A packaging of Agile Multimedia Platform that allows Managed Services Providers to build and maintain a complete relationship tool for its customers, providing a rich and integrated interface for the entire customer relationship and for all services.